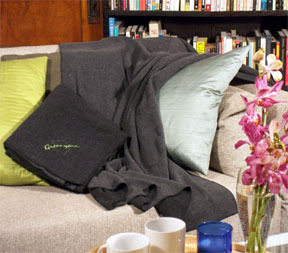 All of Greenyarn's 43" x 53" fleeces are created from ultrasoft Eco-Fabric, ensuring the greatest comfort while the far-infrared absorbing nano-particals keep you warm. The Eco-fabric in our fleeces also prevent static electricity buildup, so say farewell to the snap, crackle, pop of wintery shocks when using the fleece in the chilly winter. Our fleeces are antibacterial and deodorizing, suitable to be used both outdoor during a hiking trip, or just indoors while you watch television. Some users claim that the fleece actually improves sleep and there is no more nightmares without the static buildup, so get it and try it for yourself.